This interview was originally published on July 20, 2011 on the Japanese Nintendo Website. 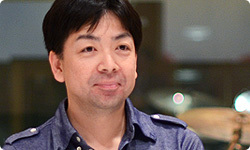 This interview features videos captured from the Japanese version of the game. In the UK & Ireland this game will be available in English. This series began with your desire to change Japanese people’s sense of rhythm, and that energy is alive this time, too. Yes, it really is. I still want Japanese people to work on their rhythm, even today. I’m Koji Kamada from TNX.2 Nice to meet you. 2TNX Inc.: A Japanese integrated entertainment company with its head office in Minato Ward, Tokyo. 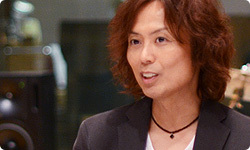 Tsunku-san is company president. This is the first time we’ve met. It’s a pleasure. 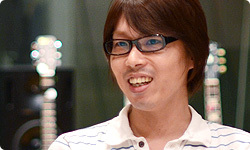 As sound director, I took the songs that Tsunku-san had made and gave them form based on rhythm theory. What exactly does that involve? 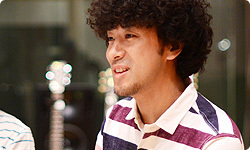 There are melodies and rhythms in the demo songs that Tsunku-san makes that you cannot fully express through the notes you generally see on a musical score. We paid a lot of attention to faithfully recreating the feeling of those songs. Hello, I’m Hiroshi Iida. 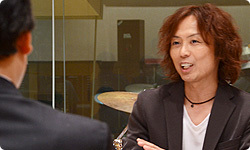 As Tsunku-san’s assistant, I have helped supervise the games from the original Rhythm Tengoku 3 for the Game Boy Advance system to the new Beat the Beat: Rhythm Paradise, and I also served to relay information between everyone in Kyoto and TNX. 3Rhythm Tengoku: A rhythm game released for the Game Boy Advance system in August 2006 in Japan. It is the first game in the series. The game was not released outside of Japan. Iida-san, you have been involved ever since the first game. 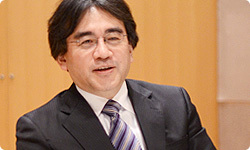 And this time, as well, you played a prominent role in communications with Nintendo, so we are deeply indebted to you. 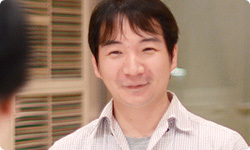 I’m Takeuchi from the Software Planning & Development Department at Nintendo. I was in charge of overall graphics direction when it came to characters and the world within the game. I’m Yone, also from Software Planning & Development. I worked on sound - part of the background music, sound effects and so forth. I’m Masaoka from Software Planning & Development. I was a programmer this time, too. I did a variety of things such as coming up with ideas and fine-tuning the game. Okay, thank you. 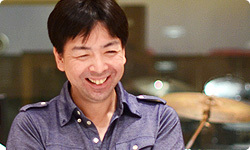 Tsunku-san, the previous game, Rhythm Paradise , sold about two million copies. To start from zero and develop the second game in a series into such a widely accepted product is extremely rare. How did you feel as it spread? I think many people started playing the series with the previous game. You can play for only five minutes if you want, or play over and over again, or say, “Let me play a sec.” It has the basic elements essential to video games. And it has rhythm, which is universal, so I think it took hold among everyone from children to adults. It steadily spread. You once talked about how there are lots of music games, but they are frustrating to you because you think, “Am I supposed to press a button here?” I feel like you have been able to make these games feel good by placing the rhythms where they make sense. If that is the case, then I’m glad. And until now, music games have tried to be difficult by ramping up the tempo, increasing the number of notes, and introducing unnatural timing, but that didn’t seem quite right to you. Right. In this series, sometimes the difficult games have fewer notes or a slower tempo. It feels good to skilled players. And when less skilled players become able to do it, they feel an incredible sense of achievement. In that respect, I think you have been partially fulfilled, with the past two games, in your ambition to contribute to improving the sense of rhythm that Japanese people have. What motivation drove you this time? When you watch someone playing a rhythm game, you think, “Why did you mess up something so easy? Let me do it!” But then when you try to do it, you can’t. And that’s the fun. Beat the Beat: Rhythm Paradise is particularly exciting at home. Unexpected mistakes will please your family. For example, if a couple plays, the boyfriend - who’s always teasing his girlfriend - may find his girlfriend is much better! (laughs) Then, once you do it three or four times, you’ll definitely improve. That’s an important point. You can confirm your own progress, and smiles appear on the faces of those around you. In that respect, it may have been inevitable that the series, which grew up on handhelds, should make the move to a home console. 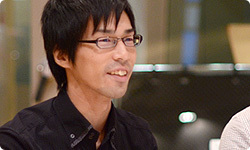 Takeuchi-san, how did you develop the potential of Beat the Beat: Rhythm Paradise at Nintendo? First, we considered which would be more appropriate for the series, pushing buttons on the Wii Remote controller or swinging it around. We had Masaoka-san make a prototype, but getting all excited and swinging the Wii Remote controller around made our hands tired. That’s right. When you swing it around for a long time, you get tired and it gradually becomes too strenuous. The number of times you would have to swing it would be higher than in other games. At first, I suppose you figured the Wii Remote controller was for swinging around, so you tried to figure out how to make that compatible with the series. Yes. But if we had focused too much on swinging the Wii Remote, you wouldn’t be able to play the game. Compared with a game like Wii Sports4, this series requires an overwhelming amount of input from the player per time of gameplay. I actually never thought of the Wii Remote controller as something you absolutely have to swing. Then you guys came to me and hesitantly said button input alone would work best, and I said “wouldn’t just buttons be perfectly fine?” 4Wii Sports: A sports game featuring five sports: tennis, golf, bowling, baseball and boxing. It was released simultaneously with the Wii console in December 2006. The sequel, Wii Sports Resort, was released in June 2009 in Japan. It wouldn’t be any fun if there weren’t any games like that. It’s all right! (laughs) It’s clearly against the general direction of today’s video games, but that makes it stand out all the more. We experimented with 3D models, but 2D graphics responded to pressed buttons with greater speed, so we could make the movement snappier. Sometimes graphics can feel wrong if they’re too realistic. For example, if you press a button to punch, there’s an instant during which the arm moves from the starting pose to the outstretched punch. More realistic graphics would look unnatural there. But in somewhat abstract graphics, that’s okay, because it is acceptable to our senses. So you actually went through a lot of trial and error and ended up with the game as it stands today.